The York 2001 Multi Gym is a home gym that boasts 54 exercise routines. Some of these include bench presses, leg curls, leg extensions, lat pull-downs and seated rowing. Resistance is provided by cables attached to a stack of 12 weights that provide levels of resistance up to 140 pounds. The York 2001 home gym is delivered in kit form, and must be assembled. Unpack all the parts where you plan to assemble the machine. Make sure there is enough space, as the dimensions are 40 inches wide by 102 inches long by 82 inches high. Check you have everything that is listed on the parts list you received. Assemble the bench first. Take the upholstered piece and lay it face down. Take the two bench leg pieces and attach them to either side of this bench using six ¼-inch x 2-inch round head screws. Attach the three braces on the outside of the legs according to the instruction manual, so the pulley will be about 2 ¼ inches from the floor. Braces are attached with 3/8-inch x 3 ½-inch long bolts with nuts and washers. Put 10 of the square black plugs and put them in the end of each leg and each brace piece. Turn the bench upright. Attach the leg curl assembly at the end of the bench that has the brace with a pulley. Bolt the upright piece to the two braces using 3/8-inch x 3 ½-inch bolts with a washer on both sides of the brace before attaching the wingnuts. Attach the round rubber bumpers according to the instruction diagram. Hook the 42-inch cable onto the leg curl attachment and feed it under the bench so it can be connected to the weight stack later. Place the base of the standing unit in its final position, as it will be difficult to move when fully assembled. Attach the small horizontal bars to the base. Place the 3/8-inch x 3-inch piece of rubber on top of the horizontal bar to cushion the glide assembly. Attach the tall vertical upright arch to the base and the curved side pieces that help secure it to the base. Attach the attachment that sticks out horizontally at the top, making sure the metal bracket is on the underside. Attach the uprights that will hold the weight stack to the small horizontal bars at the base. 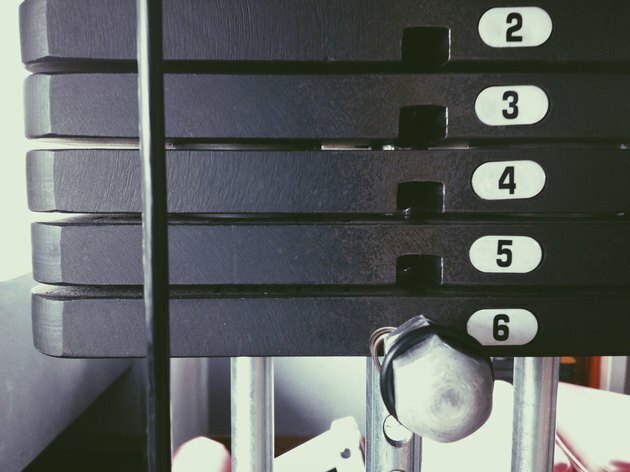 Slide the weights on, one at a time, then slide the glide assembly down until it rests on the weights. Attach the top of the vertical poles to the horizontal attachment at the top. Join the bench with leg curl attachment to the standing unit and check that all nuts and bolts are firm. Run the 55-inch cable for the lat pulldown bar through the two pulleys at the front of the high bar and down to the top of the glide assembly. Run the 134-inch cable from the back of the base through the back pulley on the high bar to the top of the glide assembly. Attach the lat pulldown bar and the bench press bar. Assemble so that everything is hand tight until it has been aligned properly, then tighten up all attachments before using.